Are you looking to participate in an upcoming fun run, walk, ride or charity event in Melbourne? Many clients of MaxNRG Personal Training improve their fitness and running ability so much it’s not long before they are entering fun runs and charity events that are held throughout Victoria. Whether you’re a serious runner training for marathon or triathlons, or just wanting to enter a fun-run to help support a certain charity, we can cater for your needs through not only personal training and group training but also provide you with your own running program to follow. Depending on the time of year we have clients preparing for full and half marathons, City2Bay, Melbourne Summer Cycle, Run for the Kids, Mothers Day Classic, Run Melbourne, Melbourne Marathon and just about every other event on the Melbourne calendar. Every year huge numbers of people enjoy participating in fun runs and charity events. As well as being important fund-raisers for several worthwhile causes, these events are great fun and can be as social or as challenging as you like. Fun Runs are for Everybody!!! Some people approach them as pure fun (e.g. run in a spiderman outfit or a hula skirt), some enter as a team and run as group while others tackle it as a personal challenge. There is always an upcoming charity fun run or event which can provide the perfect opportunity to give you a set date to achieve your goal and provide motivation to exercise more leading up to the event day. These events can be very good as motivational targets for your own fitness program. How to prepare for a Melbourne Fun Run? Whether you want to complete one these events in a competitive time, beat your best previous effort or simply try to complete the course for the first time, MaxNRG Personal Training can help you get there with a carefully structured program based around you fitness goals. No guess work, no wasted time and effort on ineffective training styles…we will use our proven running training experience to take you from where you are now, whatever your fitness level, all the way through to the excitement of the Big Event itself. Another great thing about most of the fun runs and events held in Melbourne is that the proceeds they generate through entry fees, sponsorships ect, are donated to a whole range of worthy causes. Keeping motivated to exercise for weight loss and fitness is often one of the hardest obstacles to overcome and participating in exercise related events like fun runs, walks and bike rides for charity can be a powerful motivator for people. Herald Sun Run For The Kids – This fun run has 2 distances a 14.38km run and a 5.2km run. The shorter 5.2km scenic course is available to allow people to participate that do not feel comfortable about running or jogging 14.38km but wish to be involved in raising money for the Royal Children’s Hospital Good Friday Appeal. Melbourne Mother’s Day Classic – The Melbourne Mother’s Day Classic involves a 4km and 8km walk and run around Alexandra Gardens and the Tan Track. Run Melbourne – The Run Melbourne charity event (which was first known as ‘Run to the ‘G’) has become synonymous with Melbourne. This year the fun run will be offering participants a half-marathon, a 10km run and a 5km run or walk starting and finishing at Federation Square. There is also a free Run Melbourne Expo and a 3km Kids Run. The Melbourne Marathon Festival – The Melbourne Marathon Festival we presume will involve 5 different events. There will be a Marathon (42.195km), Half Marathon (21.1km), 10km Run, 5.7km Run and a 4km Walk. Details of this years festival and registration were unavailable at the time of writing this page. These are just a handful of the fun runs that are on in Melbourne. 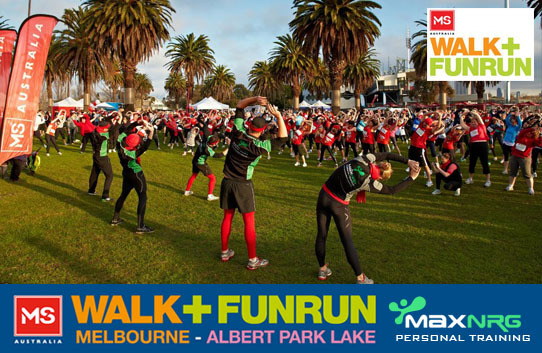 To find more fun runs, walks and organised bike rides in Melbourne view our events page. MS Melbourne Cycle – The MS Melbourne Cycle is a 25km ride or a 50km ride starting at Alexandra Gardens and finishing at Princess Park, Carlton North. Around The Bay – Around the Bay – Fundraise for The Smith Family is a ride for everyone, with distances from 20km – 250km around Melbourne’s iconic Port Phillip Bay. The RACV Great Victorian Bike Ride – The RACV Great Victorian Bike Ride provides bike riders with an affordable, supported, bike riding, camping holiday visiting great destinations that is fun, challenging and friendly. Plenty of other bike rides happen all year round. There is usually a choice of distances and in the larger events the field is divided in sections to suit people with different performance aspirations. To find more cycling events View our events page. If your goal is to lose weight and improve your health and fitness, fun runs, walks and bike rides are perfect for people of any age, fitness level and experience. Sign up and tackle the challenge of a Fun Run. If you are looking to train for an event or simply just get fit a personal trainer is the fastest and most effective way to achieve results. Your trainer will provide you with ongoing fitness training, education, motivation and support, all in a 1-on-1 environment. Contact – MaxNRG Personal Training today to help you prepare for an upcoming fun run or event. We will provide you with a carefully structured program based around you fitness goals and be with you every step of the way to motivate and inspire you towards competing on the big day.